The magnificent nativity displaying the birth of Jesus in Bethlehem is displayed at the White House again this year by the Trump family. However, in 1968 there was a growing movement to remove the nativity scene from official government holiday celebrations and by 1973 a court ruling banned the display of a life-size nativity or any other religious symbols from the annual Pageant of Peace. The ban on the nativity scene held from the Nixon era until the Reagan era when the ban was finally overturned. In 1984 the nativity was able to make its appearance once again to the Pageant of Peace. 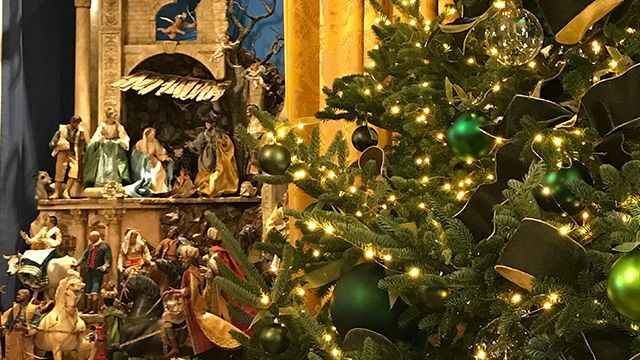 During the Christmas season of 1961, before the ban of the nativity scene and other religious symbols, a beautiful 18th century Neapolitan creche made of terracotta and carved wood from Naples, Italy along with a backdrop of delicate gold curtains were installed in the East Room of the White House. It became a centerpiece of the annual White House Christmas decor. In fact, President Kennedy’s 1963 Christmas card featured a photo of the creche organized in shape of a Christmas tree. The creche was made a permanent gift in 1967, when Mrs. Charles W. Engelhard, Jr. of Far Hills, New Jersey donated the creche to the White House collection. (Edited from source: mynativity.com Displaying a nativity is a tradition that goes back to the time of St. Francis of Assisi in Italy. Please consider displaying a Nativity scene in your home or yard this year to honor the Birth of Jesus! SHARE this to Inspire!